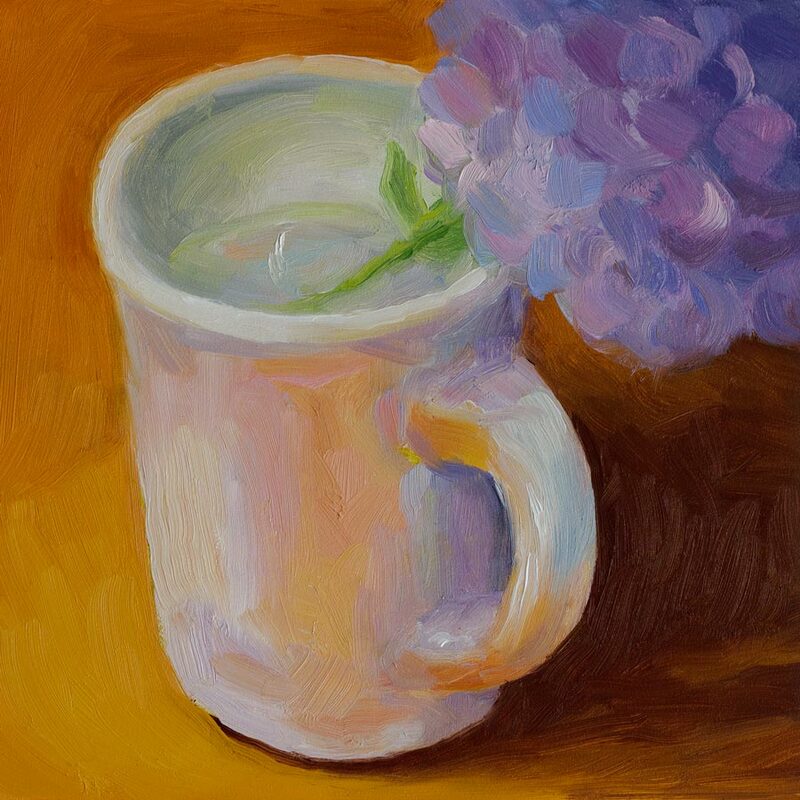 Cup of Hydrangea, oil on panel, 6x6"
I did this a few weeks ago when I needed to do a warm-up sketch in oils to get back in the flow after not using them for a while. I tried to work quickly and not go back over areas. I had fun and like the colors. Nice – the mug looks opalescent (or is that pearlescent?) Something “escentially” pretty! Just lovely! Your colors sing and bring back memories of Summer when my own hydrangeas were in bloom…. That mug is fantastic, Jana. Gorgeous color there, no wonder you like it. This is a wonderful painting! I agree with the other comments—your use of color is glorious and gives the mug an opalescent sort of look. What oils are you using now? At one point you were using water miscible oils but I haven’t kept up to see if that’s what you’re still using and recommending. Wonderful! I love the reflective colors in the mug! So well done! It is just lovely! I love the handling of the colors and the composition. It is quite a poetic image. The colors are vibrant and alive. Lovely work.